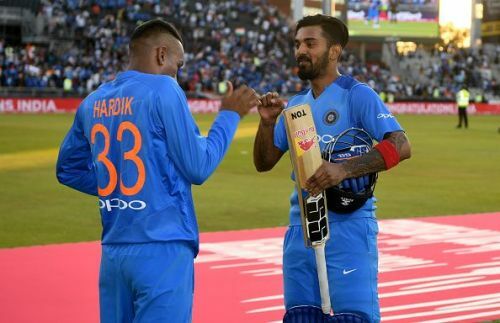 Former Indian captain Sourav Ganguly Thursday said "we should move on" from the controversy surrounding Hardik Pandya and K L Rahul's sexist comments because he is sure the two will learn from it and become better persons. Ganguly said he hasn't seen the 'Koffee with Karan' episode in which Pandya and Rahul's misogynistic comments on women led to a provisional suspension on them. But he offered a sympathetic view on the under-fire duo. "People make mistakes, let's not go too far here. I am sure, whoever has done it will realise and come out a better person. We are human beings not machines that we will always be perfect. We should move on and make sure it doesn't happen again," Ganguly said on the raging controversy. Ganguly said most cricketers are "great guys". "They (cricketers) are humble, every now and then one or two make mistakes but I know most of them personally and they are great guys," Ganguly said during the trailer launch of '22 Yards' at a suburb here. Ganguly, who has been credited with shaping Indian cricket during his captaincy stint, said it's not that modern-day cricketers are not obedient. "Look at Virat Kohli, he is such a fantastic role model. India is a fortunate country, every generation produces players who all of us cherish, there was (Sunil) Gavaskar, then came (Sachin) Tendulkar, when Tendulkar finished people thought who's next, now it's Virat Kohli. "A lot of these cricketers are fantastic human beings because they come from middle class backgrounds and fight their way up. Can you imagine 11 selected out of the millions play the game?"